My first serious attempts with the Kodak Duo Six-20 have returned from the photo lab, and as it turns out this is a camera that needs a much lighter touch than many of the other vintage Kodaks I usually shoot with. The wide - and accurate - aperture and shutter range and the very exact focusing mechanism allow for great shots while at the same time limiting the room for error. Out of my first roll of 16 photos were only maybe two or three that look like I knew what I was doing... here's one of them. 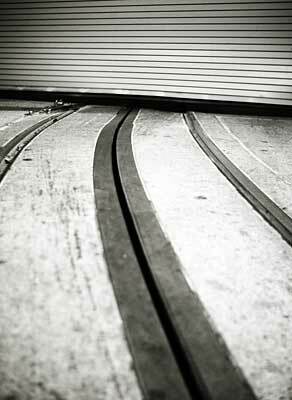 This is the entrance to the Cable Car shed in San Francisco after hours - the End of the Line.